Summer is knocking at my doorstep and I'm already in LOVE. and NOT fall hopelessly in LOVE? Lobelia are native to South Africa. I would love to see them blooming in the wild. In my gardens they are annuals. but would never survive the freezing cold of our Winters. ...and dancing profusely throughout my flower beds. that puts a skip in my step and makes me smile. 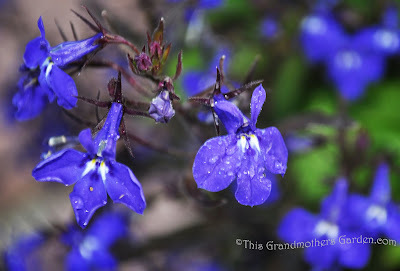 Yes, those true blue lobelias are gorgeous! Some years they have come back from seed in my garden, even though they aren't hardy. 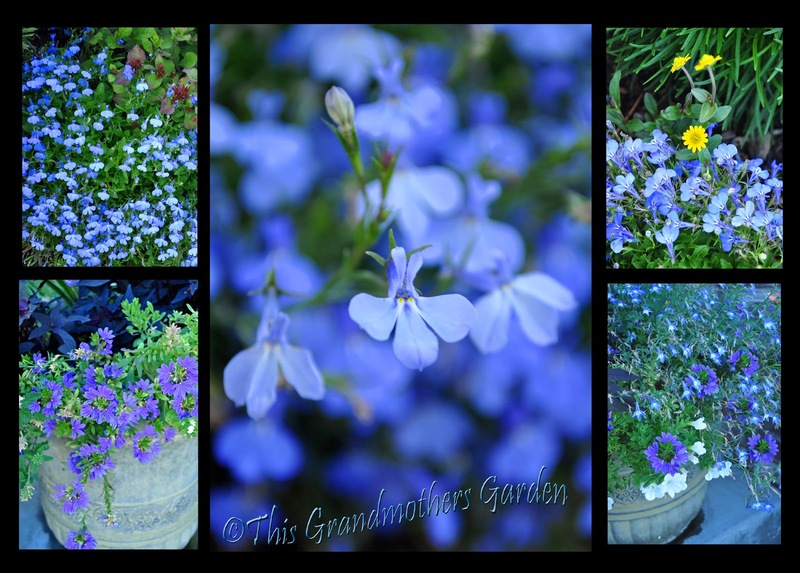 I'm staying away from annuals this year, but lobelia will show up if I get back into them in the future, for sure! That's what I call blueeeee! 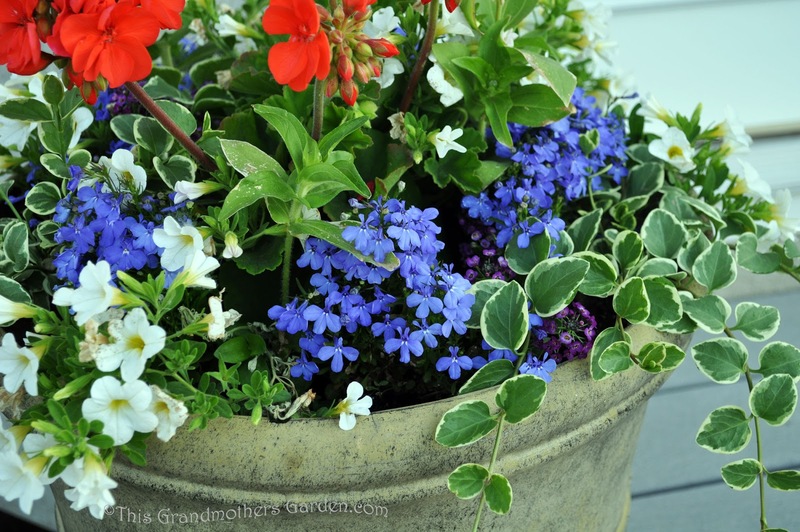 Lobelia does well initially until the heat comes in July, then bye bye. Thanks for commenting on my edging post. 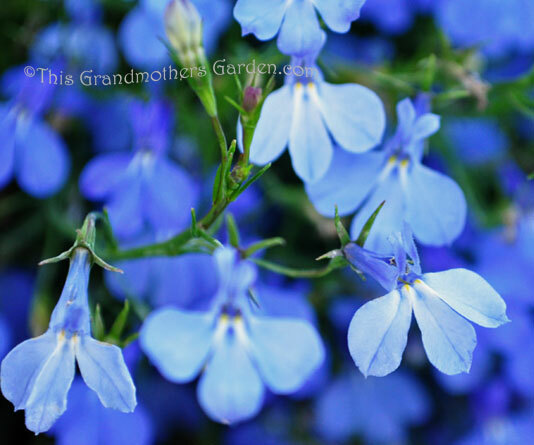 The lobelia provides a true blue color that is hard to find in a flower and yours are gorgeous. Oh I love that pot of red white and blue! 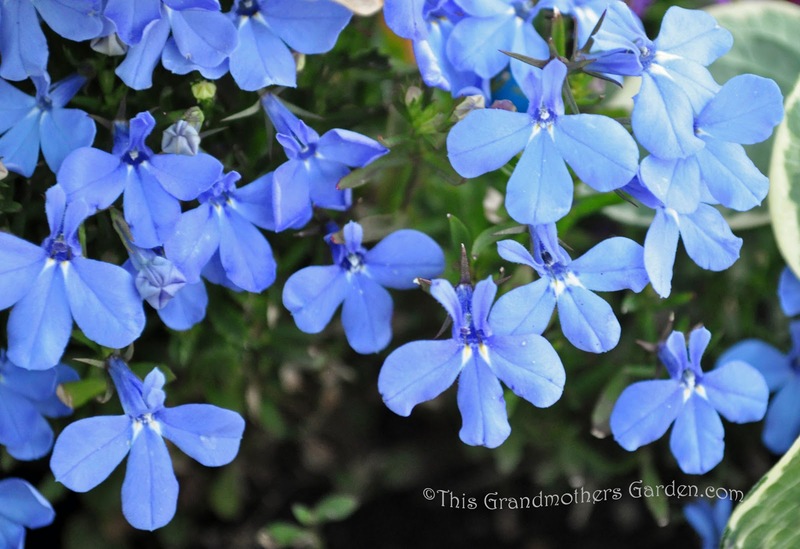 The color on your lobelia is lovely and deep, obviously very healthy. They're just so blue. It's not a baby blue..or a sky blue. Very pretty! I see exactly why you love them! 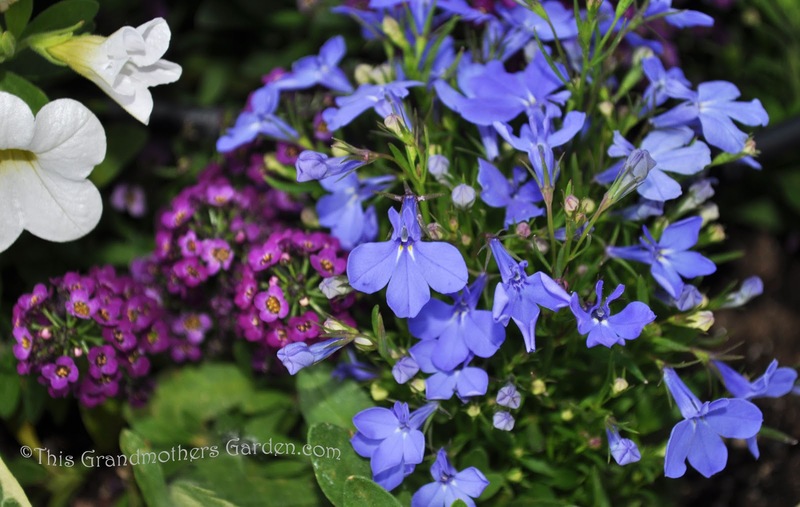 lobelia is so beutyful, blue, pink and white! I fully understand your love for it! 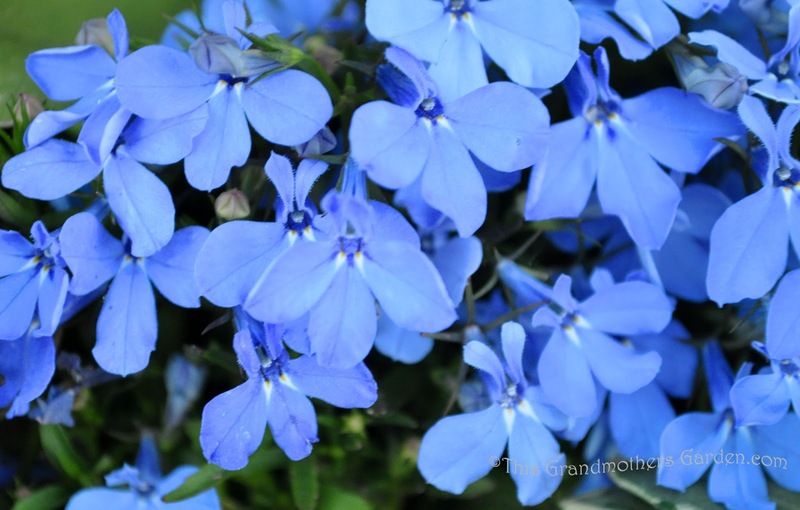 The blue in the lobelia reminds me of the blue in my mophead hydrangeas. It is such a wonderful color! It's nice to be in love in the summer - very pretty! Sorry mine is a ratty little picture. Annual here too. 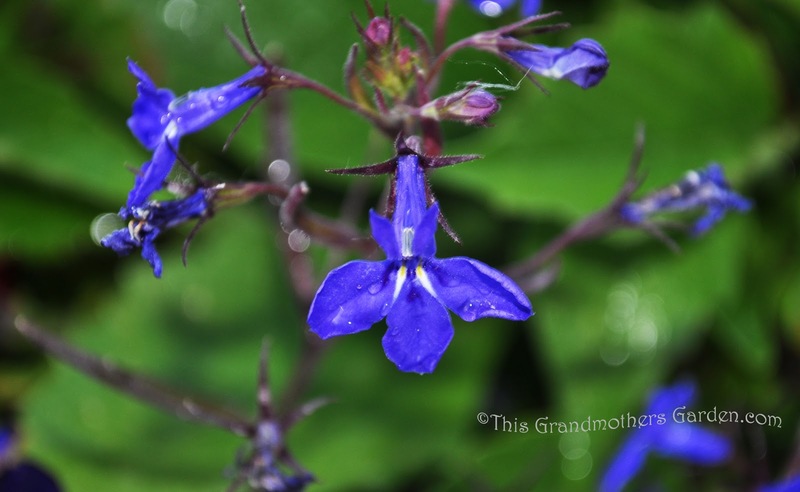 then to Lobelia, there are 360 species worldwide. 69 in South Africa including your commonorgarden one! 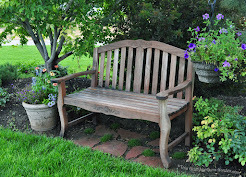 You have a beautiful blog, and a wonderful garden! Beautiful blue blog entry. 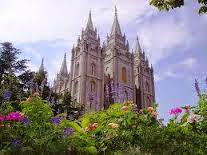 We traveled through Utah last September. It was beautiful as are your photos. Carolyn you are SO right about these gorgeous little gems : ) I usually have the dark blue ones .. but this year for some reason I haven't picked them up (must rectify that situation!!) .. they are perfect in odd containers and even drift wood .. I have done that and they look amazing in a natural container .. yours look wonderful and very happy girl ! Your photos are gorgeous! I have some blue lobelia blooming in a yellow pot. Only a handful, but they are very pretty. Lobelias are going on my wish list for 2012 after seeing yours. 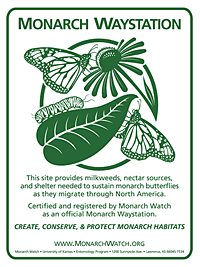 Don't know how they will hold up to our hot and humid summers but I will do some research and asking gardeners in this area and at my favorite garden centers how well they do here. I don't have much blue, only some larkspurs and that wild ageranium that I never planted. My colors are cool cottage garden colors. Your blogs/photos have given me the inspiration I need to definately add more blues in 2012. Do you grows any of the lobelia from seeds or just buy the starter plants locally? Thanks for sharing your beautiful photo and information.